Kodansha USA is planning to release Tsubasa – WoRLD CHRoNiCLE – in August. – So first of, we get Touya being Touya: grumpy and kind. – Back in Nirai Kanai, the clone fades away and Syaoran returns to “reality” (if we can call that reality). – So the crazy girl is even crazier than we thought because she thinks Hana has golden hair. – The fact that the crazy girl is unaffacted by the attacks and Syaoran is very much affected makes me think that the reality that Fye and Kurogane are seeing is the real one. – That attack Syaoran was hit with seems oddly delayed…? And Kurogane has a point: too much blood came out of it and this is not a Tarantino movie. – Oh noes, next issue is a break =( First break since TWC started. Next chapter will be out only in June 20. 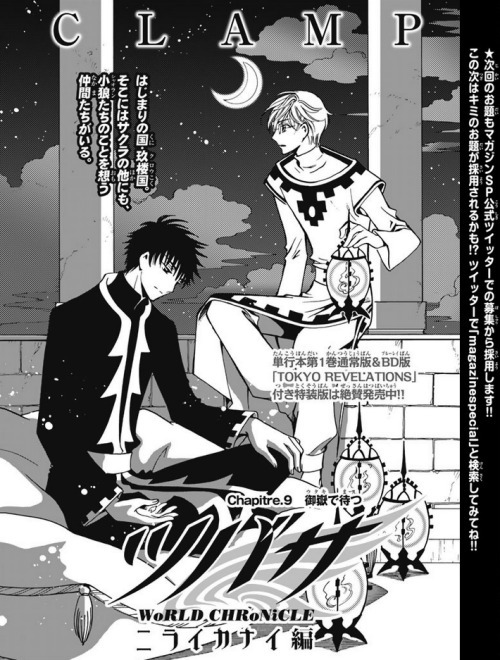 Also, by the next chapter, XXXHOLiC Rei will have well returned. I wonder if we’ll have any crossovers in Chapter 10… maybe next month’s break has something to do with it. – 29 pages this month, again (at least they didn’t get shorter this month). 88 pages for volume 2 so far. The translation seems to suggest there are 28 pages. The moment I noticed that I thought of you, haha! The last page is a double spread 😉 I was confused at first too! Interesting timing having TWC going on a break and xxxHolic Rei starting up again. Maybe I’ve just gotten more impatient over time but these breaks between chapters feels like so long – and I’m not following anything else at this time either! I’m interested to see what the attack looked like from Syaoran/the girl’s pov – Syaoran must have saw it as a threat (see when it was about to hit the girl) but still looks surprised from the shot hitting him? I don’t believe the clones are returning in full body shape. I don’t think CLAMP will “revive” them. In the CLAMP universe, when someone dies, they die for good. I think they’ll be around as spirits, or living inside Syaoran.